If you or a family member wears braces, you're used to visiting your orthodontist for adjustments and progress monitoring. But it's just as important that you continue regular visits with your family dentist, especially if you begin noticing abnormalities with your teeth and gums. We need to be on alert for dental health because risks for disease increase during orthodontic treatment. Most oral infections arise from plaque, a thin film of bacteria and food particles on tooth surfaces. You avoid plaque buildup by brushing and flossing at least once a day and undergoing semi-annual office cleanings for any remaining plaque and calculus (hardened plaque deposits). Braces, however, can complicate hygiene. It's harder to get into areas blocked by the brackets and wires with your brush or floss. This can quickly give rise to gingivitis, a form of periodontal (gum) disease characterized by gum swelling. If not treated, gum disease could eventually cause the gums to detach from the teeth and lead to bone and tooth loss. The brackets and wires can also irritate the gums and cause them to swell or overgrow, a condition called hyperplasia. This further complicates proper hygiene, which then increases the risk for infection even more. 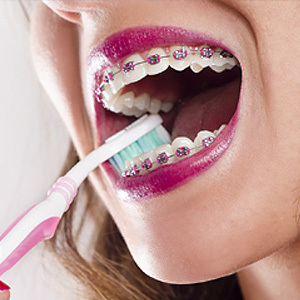 It takes more time and effort to brush and floss effectively while wearing braces. But it's necessary to prevent these problems. Interproximal brushes (which fit in the spaces between teeth) can help, as well as special floss threaders. You might also consider a water flosser, which use a high-pressured water spray to remove plaque between teeth. And, don't neglect seeing us on a regular basis. If you notice gum swelling, redness or bleeding, contact us as soon as possible. If the swelling is due to hyperplasia, treatment could wait until after the braces come off, as long as there doesn't appear to be any gum detachment from the teeth. If there is, though, you may need to see a periodontist (a gum specialist) for further evaluation. It may be necessary in advanced cases to remove the braces to treat the underlying gum condition. It pays to keep a close eye on your teeth and gums while wearing braces. Catching problems before they become too serious will help ensure your new smile is just as healthy as it is attractive.